Digital editions aren’t necessarily an alternative to print editions – in many ways they’re complementary. Lots of print subscribers like to be able to search a publication’s archive or read the latest issue in the most convenient format at that moment, whether that’s an iPad app in a coffee shop or a waterproof (perhaps slightly damp) paper edition in the bath. We’ve long encouraged this kind of “combined” subscription by allowing publishers to offer their print subscribers access to the online edition. All the publisher needed to do was collect the subscriber’s email address, enter it into our system and we’d set them up with a year’s online subscription. The difficulty with this arrangement has always been keeping the digital access in sync with the print sub, so that renewing one extends the other (and cancellations are honoured). Keeping track of the two subscriptions manually can become a pain. 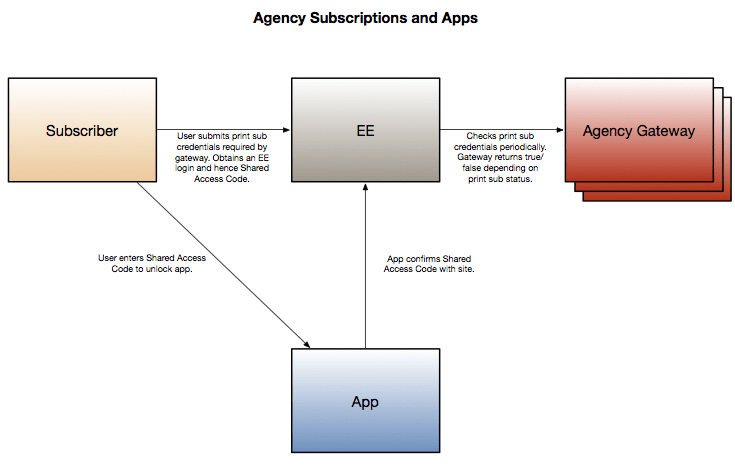 This is why we were excited last week to introduce our new Agency Subscription arrangement. This automates the online subscription handling, so publishers can offer all their print subscribers automatic access to the digital edition on the web and via a branded iPad app. The key to this has been to integrate with the magazine’s print subscription agency. They were able to offer us a very convenient gateway for checking subscription details, so our servers can talk to theirs to check whether a print subscription is still running. Instead of the publisher re-entering subscription data on our systems, the subscribers themselves can claim their free online subscription via a web form. In the background we check the subscriber number against the agency’s gateway and set up a new digital subscription. Our servers periodically re-check the credentials to keep the digital access in sync with the print subscription. The system’s now been running for a few days and we’ve seen encouraging take-up from print subscribers. We hope to repeat this with other titles over the next few months.